Bob Dorr, respected aviation author and columnist passed away in 2016. In 2015 Hush-Kit had the pleasure of talking to about the subject of USAF and its capabilities and role in the modern world. What is USAF’s role — and is it used correctly? I would like air power (meaning, the Air Force) to be recognised as the primary instrument in war. The role is to use long-range, land-based air power to deter or defeat strategic threats. This means that the Air Force must be much more than just “a partner in the joint fight,” to quote former chief of staff General Norton Schwartz. The Air Force is not an adjunct to other services. It is, and should be, the primary service branch. 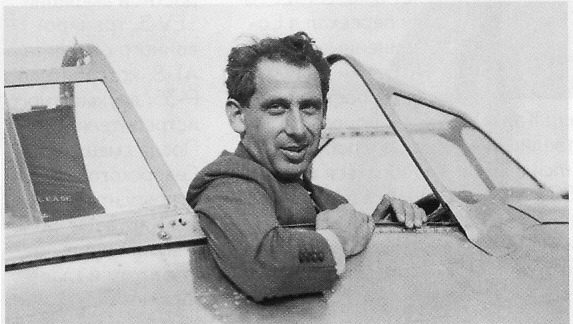 These views are similar to those expressed by Alexander Seversky (pictured below) in his book ‘Victory Through Air Power‘ in 1942. Is USAF really underfunded — surely it is the wealthiest air force by a significant margin, and the USA has not been attacked by a nation state since 1945? We need funding for a new bomber, tanker and rescue helicopter. That doesn’t mean we need more money. It means we must address people costs and base costs. We can get plenty of income without increasing taxes by rationalising our personnel system—it no longer makes sense to be able to retire at age 37 with a pension—and by closing bases. We’re spending money on electricity, running water, roads, and all sorts of administrative costs at bases that we don’t need at all. The Long Range Strike Bomber is a big deal: Lockheed Martin have teamed up with Boeing (concept pictured) to try and win the order, the rival bid is from Northrop Grumman. Rumours that the aircraft will be named the ‘B-3 Chomsky’ remain speculative. What is the current vision for the future bomber and is it the right one? The Air Force is working hard to “get it right” with the Long Range Strike-Bomber (LRS-B), which may eventually be designated B-3. In my view, the service is devoting too much attention to the LRS-B as a sensor fusion platform and as an intelligence, surveillance and reconnaissance aircraft. I would like the priority to be on delivering ordnance to target, anywhere on the globe. Very little is public about LRS-B but it’s possible the Air Force will give me what I want. Many have criticised the F-35, how do you rate the Euro-canards and do you think they are a valid alternative for air forces not wishing to buy into F-35? I’m not an expert on European fighter designs. My view is that stealth (the principal advantage offered by the F-35) is overrated. Alarmist comments by Air Force officials notwithstanding, so-called fourth generation fighters can survive in a modern, high-tech battlespace. Since I want to protect our industrial base—especially the St. Louis, Missouri fighter production line—I would prefer to see overseas buyers purchase advanced versions of the F-15K Slam Eagle, F-16E Desert Falcon, or F/A-18F Super Hornet. 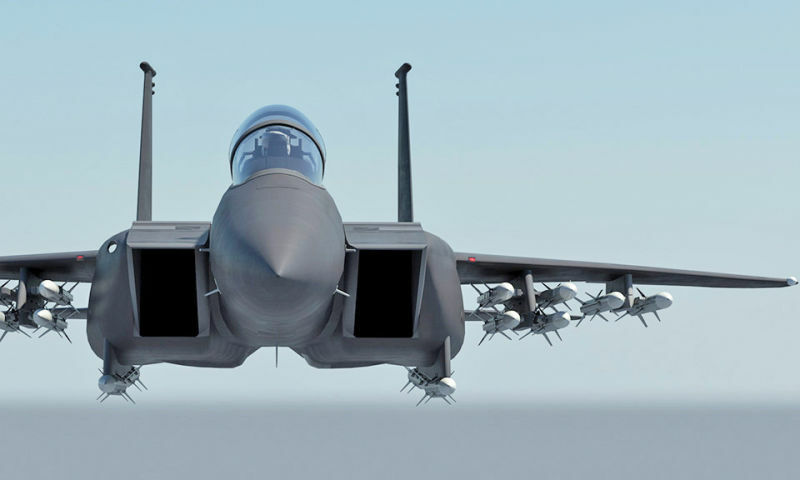 Boeing has released artworks of a F-15 ‘missile truck’ configuration. Armed with sixteen AIM-120Ds this unlikely proposition could see the Eagle bolstering the missile-light F-35 force. F-35s could act as stealthy control aircraft for traditional, more heavily armed fighters. This tactic has been tested with F-22s and Typhoons and is reportedly extremely effective. What is the biggest mistake regarding USAF in recent years? What is the point of the European F-22 deployment and what are your views on this? The current F-22 deployment to Europe is the sort of thing we do routinely. It’s no doubt intended in part to send a message to Russia’s Vladimir Putin about tensions in Ukraine and the Middle East, but I’m not too sure just what that message is. We should employ the F-22 routinely where possible and that’s what we’re doing. In the book ‘Air Power Abandoned’ I cite four occasions when US military leaders wanted to deploy F-22s abroad and Gates refused to allow it. How many USAF aircraft types did you think remain in the ‘black’ world and what roles do think they serve? There are no manned aircraft in the ‘black’ world and never were any that we don’t know about. There’s an entire industry devoted to covering imaginary “black” aircraft and its practitioners include some respected writers and publications who ought to be ashamed of themselves — but the ‘black’ aircraft are no more real than the little green men. There is at least one totally black drone program. The F-35A performed badly in BFM tests against the F-16D, what are your thoughts on this? I haven’t studied this specific event but the F-35A doesn’t seem to be a very good air-to-air fighter despite being packaged and sold as such. The F-16 remains a very formidable fighting machine. The extent to which basic fighter manoeuvring matters in today’s world is a topic of considerable debate. 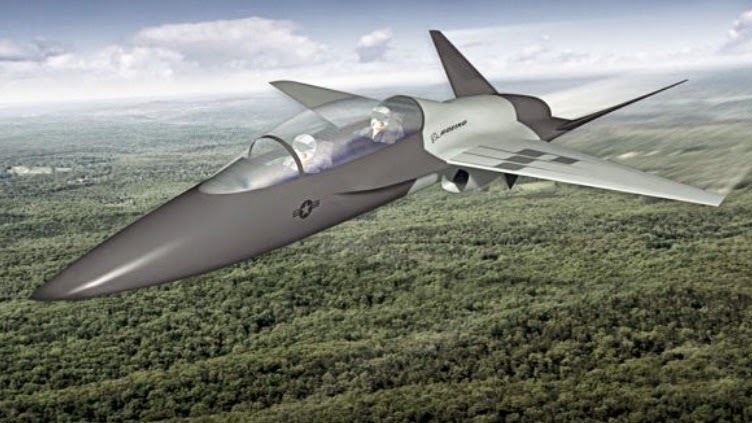 A Boeing concept for the US’ future trainer need. Boeing has since teamed up with Saab, the current configuration is yet to be announced, but is expected to retain some of these features (it may also feature canards). Who do you think will and who do you think should win the T-X trainer programme, does the F-35s performance merit a supersonic aircraft? The roster of possible candidates for T-X has been a moveable feast, with many changes in recent months. In previous trainer competitions, I not only studied the candidates, I flew in most of them. There has been some discussion of returning to a universal scheme under which all pilot trainees would fly the T-38 or its replacement — enabling the Air Force to retire all T-1A Jayhawks except those used for combat systems officer training. I think that’s a good idea. I haven’t formed a conclusion about which aircraft would make the best T-X and I don’t believe supersonic speed is a necessity. A-10s future: any chance of refurbished aircraft going to the governments of Afghanistan or Iraq? I hope not. Our efforts to provide aircraft to those countries have been catastrophic failures. I want to keep as many A-10 Thunderbolt IIs in US service as long as possible. All were brought up to A-10C standard recently and have no structural issues and have engines that continue to perform well. So I don’t see a need for refurbishing but I do think we should keep our A-10s. Finally- is there a big military aviation issue that the media should be paying more attention to? If we were talking in 2005, the year you became chief of staff and I asked you to picture the Air Force of ten years from now, what would you see? Air Power Abandoned: Robert Gates, the F-22 Raptor, and the Betrayal of America’s Air Force. Signed copies of this book are available on line or directly from Bob on 703 264-8950 or by email at robert.f.dorr@cox.net. Strong stuff but I am always wary when someone has a book to plug. Totally agree about the A10 its beyond belief the airforce wants to get rid of it and deploy the F35 in a role it is utterly unsuited to. Stuart if it were not for book plugs, you would have very little print content, talk radio or talk television. When you see someone in print and especially when you hear someone on the radio, it’s because of a book. How else might you learn about a new book? I’m in a somber mood this morning on the anniversary of the United States Air Force and your uninformed comment concerns me. Fascinating interview; except of course, no American would ever say “defenceless”. I have to over-ride autocorrect to even post it! Stuart, how else would you learn about a new book? And why should I donate my work for any other reason? atcDave, I submitted my comments using American spelling and agree that the British usage looks awkward. Bob submitted it in US English and I Britisized it. Blame lays with me. ‘Britisized’ ? That looks American. Shouldn’t it be ‘Britisised” ? That’s why I am all for US Air National Guard doing Homeland Air defense and getting them More F-16’s or even F/A-18’s for Homeland Air defense. I’m strongly in favor of the F/A-18F for the homeland defense mission and wrote extensively about it in my new book, “Air Power Abandoned.” By the way, I liked the term “air sovereignty mission,” which is no longer being used. That’s why I am all for Air National Guard units pulling air sovereignty mission and giving them F/A-18 E/F’s, F-16’s or even smaller Aircraft such as the F/A-50 Golden Eagle or BAE Hawk 200. Which is perfect for air sovereignty mission and would be cheaper to operate and Maintain. He’s talking absolutely zero sense. He is speaking as a functionary with an outlook so narrow that it’s as if he views the world through a drinking straw. Or maybe he’s just speaking as a guy shilling for a book that’ll hit the remainder bins within a month. It is well known that the U.S. spends more on “defense” than the next dozen (or is it two dozen?) states **combined**. Further, unless the tectonic plates have really started moving since last Thursday, America is still a continental power bordered by friendly states and two oceans. There isn’t a nation in history that wouldn’t envy our strategic position. This is true by just about any criterion you’d care to name, beyond spending and geography — technical sophistication, social cohesion, cultural/ideological appeal. Against that, anybody who can say with a straight face that the U.S. is “defenseless” is either talking some really good drugs, or delusional, or dishonest. The air force in particular has **never** delivered on to the grandiose promises it has always made since its founding. It couldn’t even manage what ought to have been a straightforward air defense problem on September 11, 2001. No air force has won a war, ever. It’s a physical impossibility, unless your definition of “winning” is some kind of extermination campaign via nuclear weapons. (Maybe that’s an approach Dorr endorses?) In any case, it’s telling that right out the gate Dorr cites Seversky as some kind of authority. Seversky’s techno-utopian wish-thinking was by the postwar bombing surveys soon after 945. I like this web site. Please don’t waste space on military-industrial complex grifters pushing their dubious product. Air power has made the same promise since the end of WWI.